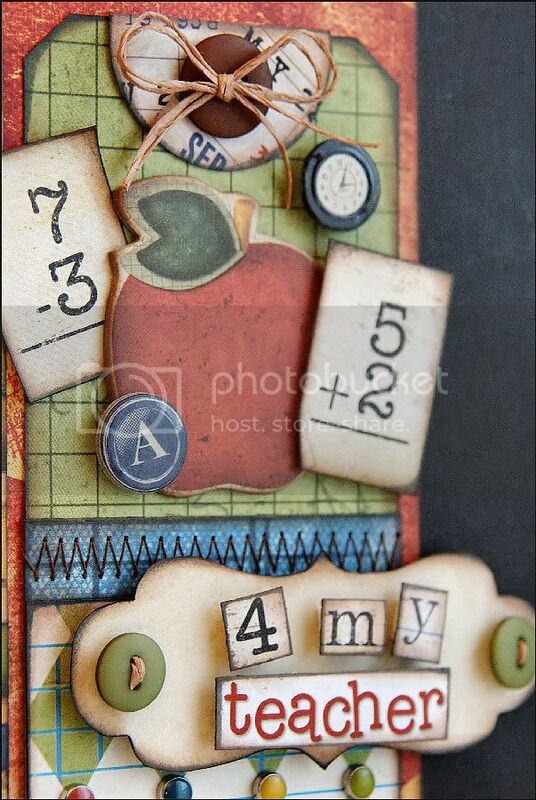 It's always fun to go beyond the scrapbook page when creating. And creating an altered project is just one way to do that. Altering something to change that item's original state or purpose is a creative way to recycle, re-use and re-purpose simple things you might find around the house. Today some of the Design Team took such everyday items and embellished them with Bo Bunny goodness. Designer Tip: To create the ribbon spirals coat them with fabric stiffener. Twist them into a spiral and then pin them in place onto a piece of Styrofoam. Let them dry. Once dry, remove the pins and use as you please. Tear pieces of patterned paper into small pieces. 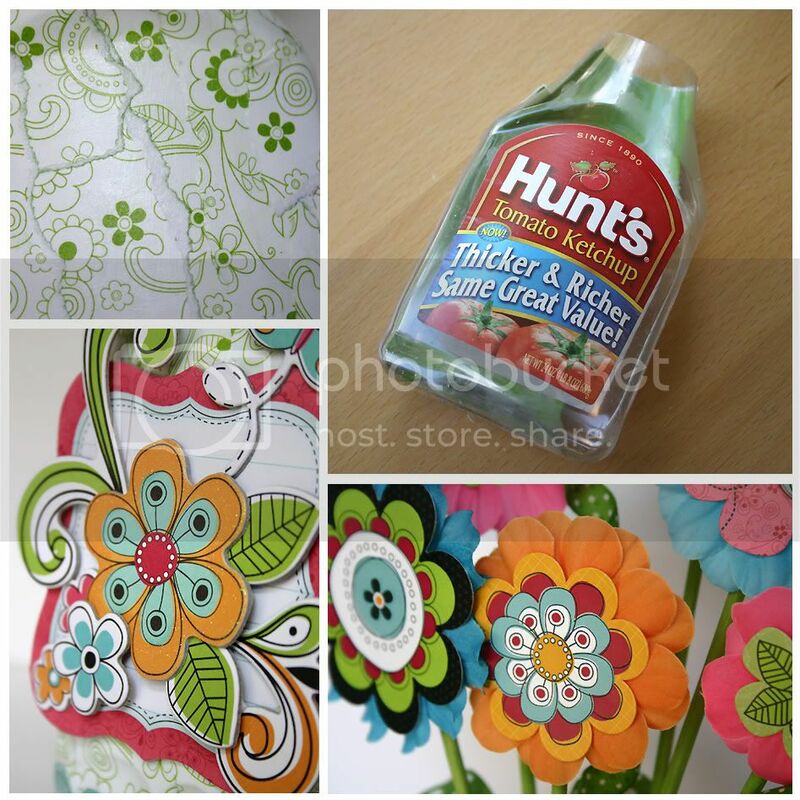 Coat each piece in a mixture of 1 part Mod Podge to 2 parts water. Adhere to object being altered by adding one piece at a time allowing the pieces to overlap sightly. Tips: The original journals were purchased in the dollar section at a local craft store. A zipper was cut in half and rolled to create the ribbon-like roses. 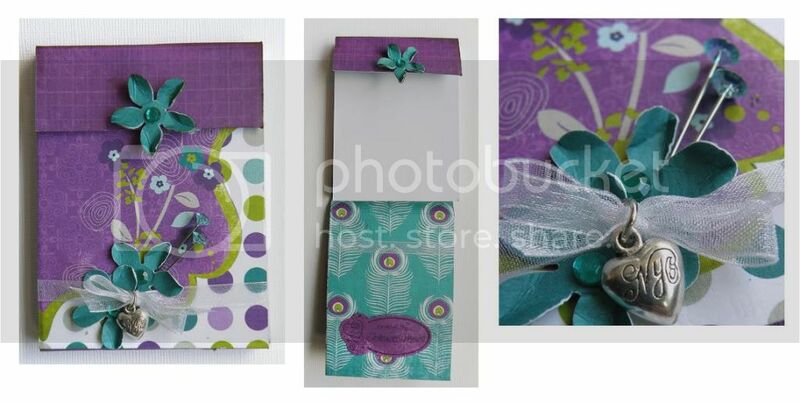 Designer Tip: Instead of adhering the paper and embellies to the container, adhere to a piece of cardstock first!! Begin by measuring the height and circumference of the container. **Make sure to add an extra inch to the circumference for overlap. 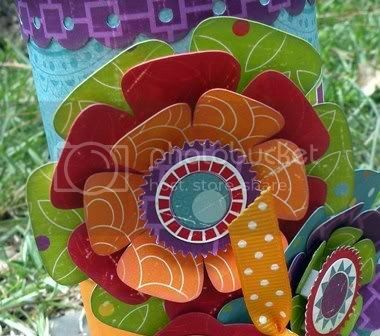 ** Then decorate the cardstock with patterned paper and embellies, and adhere to the container. This makes it much easier to adhere and to keep straight. In this day and time we are trying to teach our kiddos the value of money. And with 4 kiddos, you can imagine that we do not venture out much. 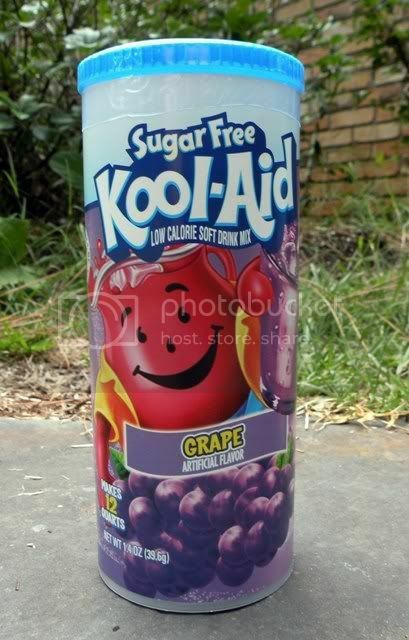 So, we decided to take one of the KoolAid containers (pictured above), and fill it with loose change and extra money. Once the container is full, we choose a family night outing! We have eaten at McDonalds and rented a DVD, gotten ice cream, and bought a new game for our Wii. The paper was beginning to get tattered, so I thought why not alter it!! 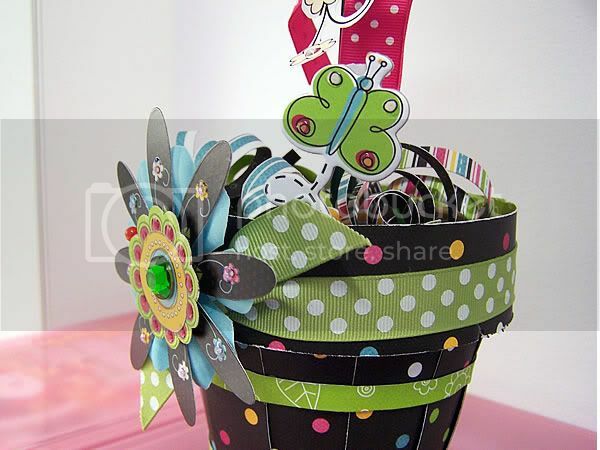 Materials used: Bo Bunny Petal Pushers Patterned Paper - Doodle, Green House and Stripes; Petal Pushers Flowers; Petal Pushers Buttons & Bling; Petal Pushers Combo Stickers; Petal Pushers 12x12 Chipboard; Double Dot Kiwi Ribbon. 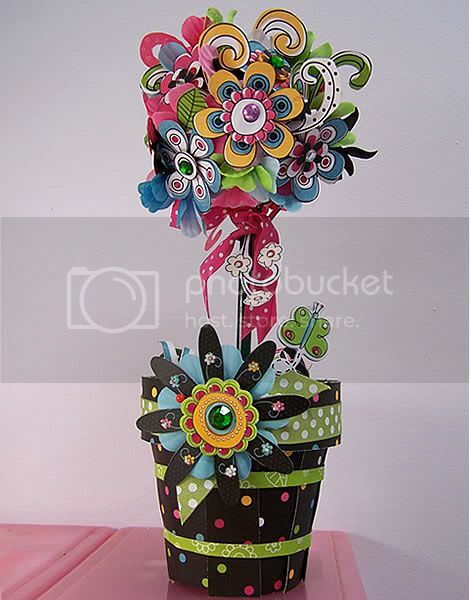 Designer notes: I had this old Topiary Tree that had seen better days, so I decided to recreate it using the gorgeous "Petal Pushers" collection. 1. 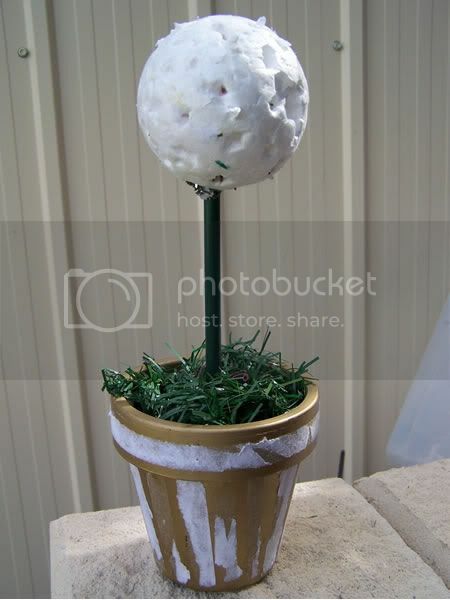 First covered the foam ball with Petal Pushers Material flowers. 2. 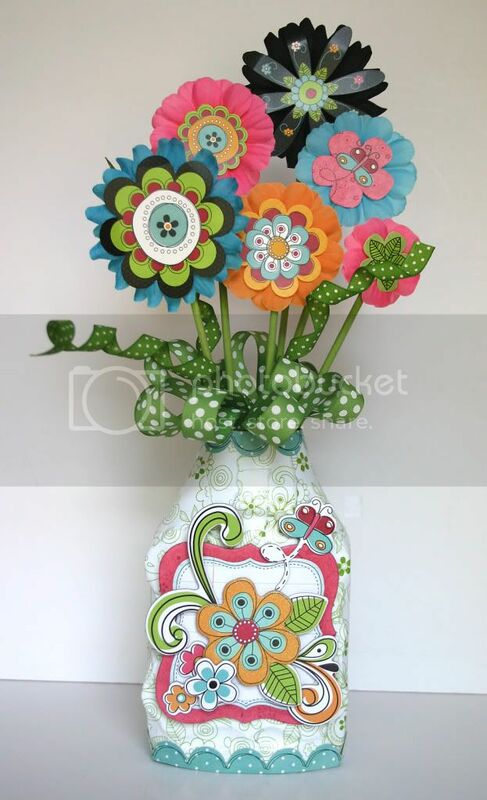 Then I cut out flowers from the Doodle Petal Pushers pattern paper and layered with foam tape, also added some bling or brads and added dimensional gloss to the finished flower for added detail. 3. 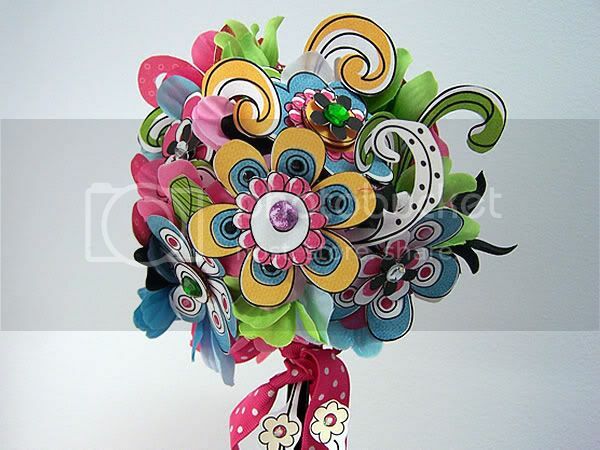 I stuck the finished paper flowers over the foam ball covered with the material flowers with a hot glue gun. Tips: I stuck stickers onto cardstock and cut them out, curled them with my fingers and used foam tape to adhere them onto my project. 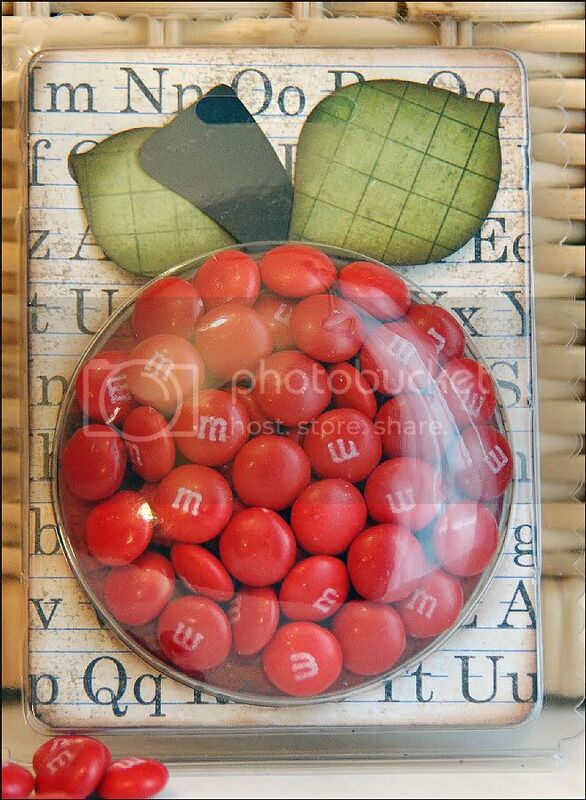 Tips: The Candy Apple gift is super simple to create if you have a plastic container that you can re-purpose like Bo Bunny's Buttons & Bling packaging. To cut the paper to fit, use the pre-cut label already inside the Button container as the template for the background. 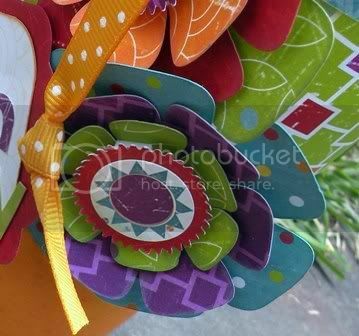 Cut out a piece of red patterned paper for the circle area as well and adhere it to the back of the container. Although the red paper is not seen well with the container full of candy it gives the project a finished look as the candy disappears. As you can see altered projects can be creative, fun and affordable. We hope you enjoyed today's inspiration and that we jump started your creative thoughts about what you can alter next! wow! These are amazing, thank you for the inspiration! What great projects! Thanks for sharing! Love these projects! Thanks for getting me to think outside the box. GREAT PROJECTS!!!! I knew I've been saving the packages to the buttons/gems for SOMETHING!!!! Amazing work guys!!! Beautiful creations! I especially love the last one by Patti Milazzo!! Oh, wow, these altered projects are awesome ladies! The creativity is really overflowing and I love it!! Wow girls!!! All those projects are amazing and so very creative!! These are so inspiring. How come the kids I teach never give me cool presents - must be that giving high school teacher a gift is uncool - although I do get the odd card. Keep up the wonderful work. Really cute projects! 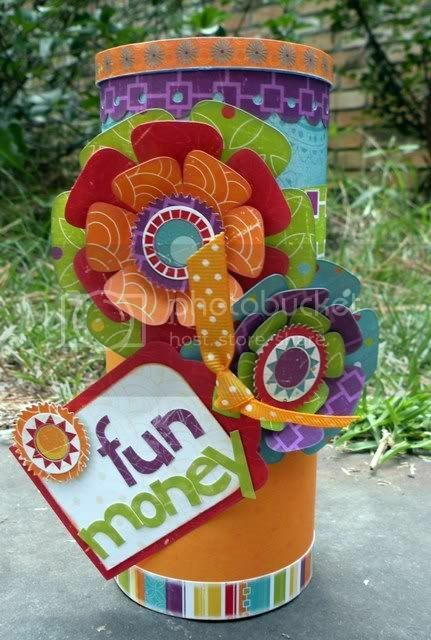 Love the idea of a 'Fun Mone' jar! 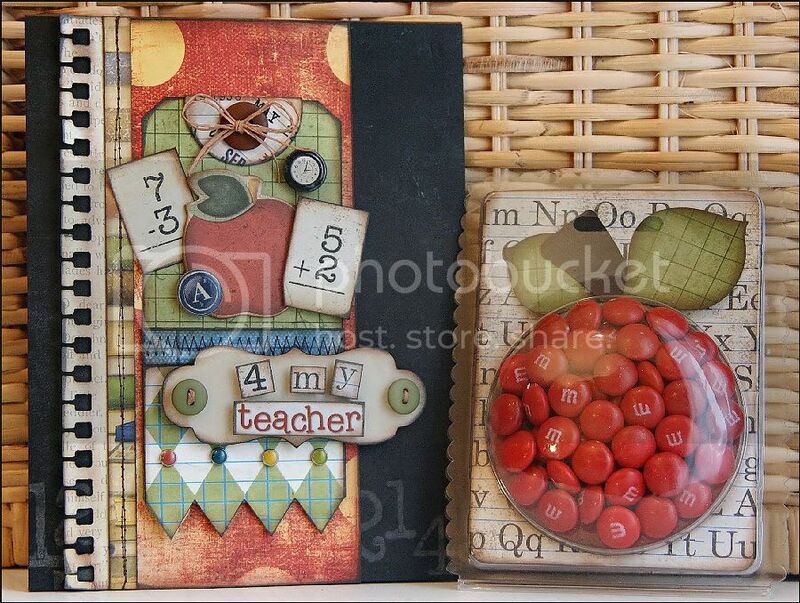 These are all fantastic projects< but I absolutely have to make the teacher journal & candy apple gift set! LOVE it! Very nicw projects. I too use alot of things around my home!! Love these!!!! I especially love the Peacock Lane items. I just think the colors make the project look so elegant and rich. Nice job on all the projects!!! Makes you realize you really can repurpose just about anything!!!! Love them all! Very creative repurposing. TFS! I LOVE to alter things & these projects just have me itching to get more done with the 25 cent journal books I just loaded up on!! you are amazing girls !! wow !